The Microsoft Pyramid Scheme, by Bill Parish. An investment advisor blows the whistle on Microsofts massive income tax fraud, and other financial crimes that make Enron look as clean as a choir boy. In Microsoft We Trust, by Phil Lemmons. How Microsofts fortune rose as corrupt judges and lawyers dismantled the Sherman Act, and why Microsoft's monopoly convictions will not result in any effective remedies or sanctions. [2011 Aug] Did You Pay Homage and Taxes To One Of The Most Heinous Humans Ever To Walk The Earth, Today? Did You Turn on Microsoft today! 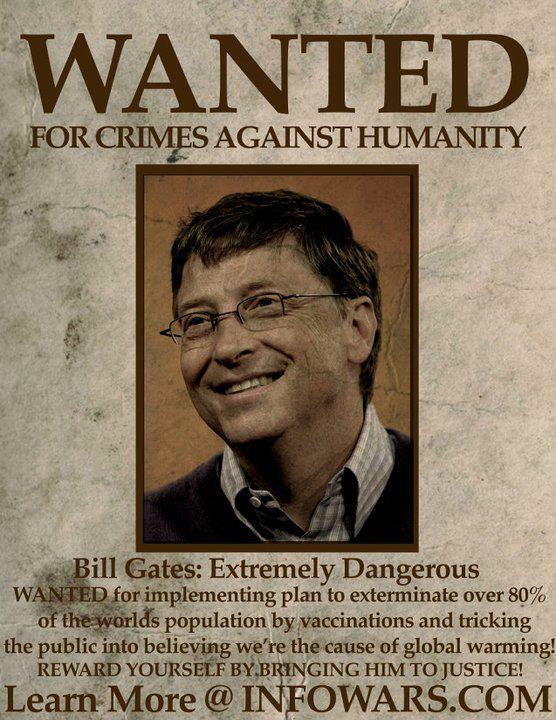 [2011 May] Polio and lemmings by Hilary Butler As I read the Bill Gates speech I was appalled at three things. Firstly, just how little he knows. There are errors of both fact and logic littered through this vaccinology hagiography, and secondly, the standing ovation he no doubt got, and thirdly, that WHO and others - who should know better, never bother to educate him properly, or the general public for that matter. But then, if they did, exactly what would they be saying? "Um.. All the disease which we once called "polio" which was caused by a raft of things, including coxsackie virus, enteroviruses, echoviruses, lead paint and toxic sprays - which all used to be lumped under one heading, is now being divided up into different headings. We're removing all the cases which are "caused" by polio-viruses, and leaving all the other cases which used to be called polio, under a larger, amorphous heading of "Acute Flaccid Paralysis" Can you imagine what the world would say if they were told that? Machines of War: Blackwater, Monsanto, and Bill Gates A report by Jeremy Scahill in The Nation (Blackwater's Black Ops, 9/15/2010) revealed that the largest mercenary army in the world, Blackwater (now called Xe Services) clandestine intelligence services was sold to the multinational Monsanto....Blackwater, Monsanto and Gates are three sides of the same figure: the war machine on the planet and most people who inhabit it, are peasants, indigenous communities, people who want to share information and knowledge or any other who does not want to be in the aegis of profit and the destructiveness of capitalism.....the purchase of 500,000 shares of Monsanto, for more than $23 million by the Bill and Melinda Gates Foundation, which with this action completed the outing of the mask of "philanthropy." Another association that is not surprising. [2010 Feb] Bill Gates: We can lower the world's population with vaccines “if we do a really great job on vaccines, health care, reproductive health services, we could lower that [his initial 2050 global population projection of 9-billion] by perhaps about 10 to 15 percent.”....We proposed several years back a birth control vaccine which induces the formation of antibodies against the human pregnancy hormone, the human chorionic gonadotropin (hCG).